Bigger developers can utilize an HTTP support API to hook in-app subscriptions into backend enterprise servers for validation and cancellation (read: DRM), as well as to make multi-platform subscriptions easier to manage. For example, buying a subscription to a publisher's entire suite of services on a variety of apps through a single in-app purchase could be accomplished without the need for messy logins - download another one of the publisher's apps that grants access to premium features through the subscription, and it just works. One of the first developers taking advantage of the HTTP API will be GluMobile, in the form of an in-game currency subscription (disgusting, I know) that can be used across all of the company's titles, without the need for a 3rd-party login or account management service. Nifty. 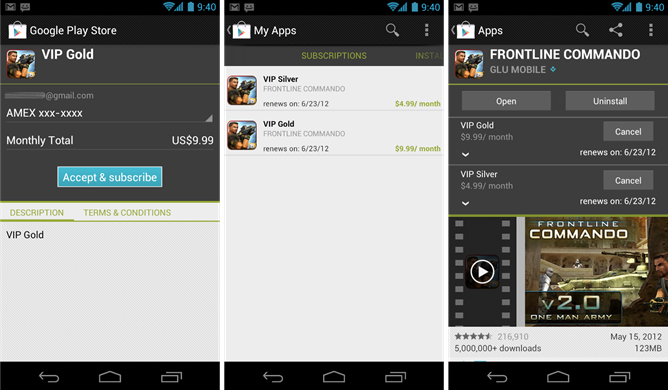 To learn more about in-app subscriptions, check out this Android Developer Blog Post.